12.11.2007 Joanne Justis is back by popular demand. We still have a few pet naming charts available. 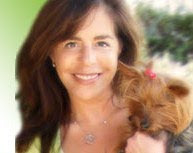 So listen to Wendy's Animal Talk on healthylife.net for your chance to win a pet naming for your own four-legged angel. For those of our listeners, who don't celebrate Christmas, but another holiday: May your holiday season bring you joy and good tidings. And may your new year be bright. It's Finally here. Wendy's long-awaited book "The Natural Pet Food Cookbook, Healthful Recipes for Dogs & Cats" is now available. Wendy's latest foray into the written word is a fascinating look at a new way of cooking for your pet. This is a subject whose time has come. With all the recent pet food recalls, many people are turning to the art of cooking for their pets. Wendy takes you from the basics: tools to use, pantry items, and new uses for ingredients you may have never used in cooking for your pet before. This is no ordinary book of treats. This cookbook has recipes for making your own kibbles, casseroles, soups, loaves and bulk recipes. There are even sauce recipes for those of you who have finicky eaters at home. All of these recipes can be made ahead and stored in the freezer, then taken out and warmed up for serving later. Not only that, they store well and can be kept in the freezer for up to three months depending on the recipe. This book is a must for any dog or cat lover that might be on your holiday gift list, and will be a welcome addition to their pet library. If you have a dog or cat of your own, it is a must for your cookbook collection as well. This is a gift that will keep giving year after year. The Natural Pet Food Cookbook is currently on sale on amazon.com for $10.19, which is a savings of 32%. Check it out and write a review. Barnes & Noble is offering it for 20% off to the general public at $11.99, and for B&N members it is only $10.79. I love the book! I have to increase all of the ingredients in the recipes because I am feeding 32 cats. Question - in the Surf and Turf on pg 84 can I substitute sprouts for the grass? I can't afford 8 cups of cut grass - it's really expensive!!! Yes you can substitute sprouts for the grass. Alfalfa is the least expensive, and probably the healthiest for your crew. You can also purchase oat grass seeds at most pet shops and sprout them yourself. There are also several online companies that offer alfalfa seeds in bulk for sprouting. It takes a bit of work, and there are many spendy methods out there.